Cooking with Dried Chickpeas = no BPA! Tips for Families: Cooking with Dried Chickpeas to avoid BPA! As an adult, I admit, I’m not always a healthy eater. I know what I should be eating and what I should be avoiding but there are times when certain food items or certain smells will call my name. 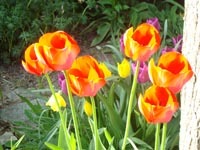 Rather than deprive myself, I eat in moderation. I’m sure I read a recent study that told me that it is better to eat in moderation than to deprive your body completely because when you do, you’re more likely to overindulge on the banned ‘bad food’. As a parent though, I’m more conscious of the food choices I make. No, I don’t deprive her either because I think it’s best she feel like foods can be eaten in moderation because over time, it’ll teach her how to self-regulate her own eating patterns. The only times I absolutely won’t buy a certain product is if I know for sure it contains the infamous and nasty chemical BPA (ie. bisphenol A). A quick google or bing of this chemical will inform you of all the lovely things it can do to the bodies of young children so I’m not going to dwell on the prolonged effects of BPA. I certainly can’t claim that all canned foods have a BPA lining but as a parent, I’d rather err on the safe side. Besides, I’m not a scientist so chances are, I’d say something wrong. However, I can tell you one way to avoid consumption of BPA laced products – avoiding certain canned products that have the inner white coating. That white coating is often where BPA is found. Why dried chickpeas (or dried garbanzo beans) for this blog topic? Well, after I gave up using all those canned goods, one thing I chose to use occasionally was canned chickpeas because for some reason, my brain thought it would be too hard to get fresh chickpeas. After all, I’m a good cook, but I’m no magician. Recently however, I’ve taken the plunge and have started to cook with dried chickpeas and discovered it’s not THAT hard! 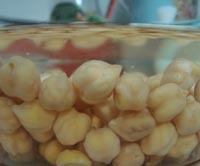 Dried chickpeas are easy to cook once you revive them by soaking them in water. That’s it! How easy is that! The tricky part is remembering that you need them the day before so you can soak them overnight. They also take a little longer in the pot to cook but if it avoids the extra chemicals that are normally in their canned cousin, I can deal with the extra cooking time. Q: Do you remember why I get them in a bag now and not in a can? Q: Do you like the way the dried chickpeas taste when they’re cooked? Q: What do they taste like? Q: What’s your favourite recipe that mommy cooks with the dried chickpeas? Q: Would you eat dried chickpeas again? 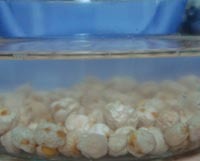 Here is my mommy method for soaking dried chickpeas. I call it ‘my mommy method’ because there are no specific measurements, just guesstimates. Cover the glass container and stick it in the fridge until tomorrow’s meal. Note: now for this photo above, I soaked them right before I left for for work and by the time I came home, they were ready for dinner so dried chickpeas don’t really need to soak a full 24 hours. You may just need to cook them a little while longer on the stove top and they’ll be just as yummy and a gazillion times better than chickpeas from a can. Throughout the soaking experience, you’ll be able to observe the chickpeas getting bigger. It’s also a really great way to introduce some science concepts to your child. Ask him/her (or them) to make observations of the dried chickpeas. What do they look like? How do they feel? Later on, fish out some chickpeas that have been soaking and ask them the same questions. Do they notice any changes? When it’s time to cook the chickpeas, it’s best to put them in a little earlier than your normal canned chickpeas to give them time to cook through. It may take about 20 – 30 minutes depending on how you’re cooking them. Now, be sure to ask your child the same questions at dinner. How do the chickpeas feel/look now? Honestly, cooking dried chickpeas is as simple as opening a can of chickpeas. Dried chickpeas also happen to taste better than canned chickpeas because they don’t have that ‘I’ve been sitting in this can and soaking in liquid for ages’ taste. Like all beans, they have a mild flavour and mush texture to them but they can be al dente too if you choose to cook the chickpeas for a shorter period of time. Yes, it does require some organization, but the advantages certainly outweigh the prep time needed. Over time, not only will you have reduced your household consumption of BPA, you’ll reduce how much you spend on groceries since a bag of dried chickpeas lasts for many many meals. And, on top of it, you’ve now got a budding scientist on your hands! Too cool!! Arla Organic Cream Cheese – creamy, decadent, delicious! So, I recently tried the Kraft Philadelphia whipped cream cheese spread (see product review here if you haven’t yet ) but when I stumbled across the Arla Organic Cream Cheese spread, I had to try it because a)it’s organic and b) it had really really simple and basic ingredients listed – pasteurized organic cream, salt, bacterial culture. Could it get any simpler than that? I admit I traverse the grocery aisles a lot because I get bored of eating the same things and cooking the same meals for the family but somehow, I end up stuck in a rut. My theory is, if I can find something new or remotely new, than maybe, it’ll help to jazz up the meals a bit (note: I’m a good cook, don’t get me wrong just a boring good cook). So, before today, I had never even seen the Arla brand before, let alone the Arla organic cream cheese. It’s certainly new at my local supermarket (didn’t see it last week, that’s for sure!). That led me to a quick bit of research online and I found out that the Arla products also contain the Tre Stelle line, a name I associate with quality cheese products (very cool!). Tried the Arla organic cream cheese today spread on a toasted bagel and I instantly fell in love with its smooth creamy texture. It was like someone had made it just for me, fresh. 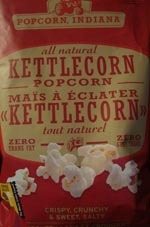 It tasted so creamy, so smooth, not too salty which is great especially if I’m sharing with my kid. The Arla organic cream cheese was really easy to spread onto the bagel (unlike the bar type cream cheese blocks). I’m not going to touch on nutritional facts since I make a point of not doing that for any of the products I review. Like I’ve said before, all in moderation! Will I buy it again? Yes, for all the reasons mentioned above. Aside from tasting really delicious, I also love and appreciate the time and effort that went into creating an organic cream cheese with basic ingredients that I can spell and feel comfortable putting in my body. I’m fully aware that I’ll still buy other foods that aren’t as healthy or as simple as this Arla organic cream cheese so I feel good knowing that I’ve added something a little more natural into my food repertoire. I understand it’s probably a little pricier and harder to afford but again, all in moderation! Let’s be honest with one another: my skin is not in the best shape. I think I have combination skin but no major break outs (knock on wood) but I’m too lazy to go get facials done, I don’t go to the spa, and I certainly don’t exfoliate or do all those fantastic things that I should be doing to make my skin better. I’d also rather spend time with my family. I’m just lazy and I’ll do what’s needed to make me look presentable when I leave the house. But, my first choice would be to kick back in comfy clothes and just hang out. Enter MAC Select Cover Up, a liquid concealer. I’ve been using MAC for ages now but have never used their liquid concealers before. Apparently, it’s better for my skin said the MAC makeup artist when I went to my nearest MAC store (can’t remember why. I think it’s because it’s easier to apply or shows less wrinkles?). She found me the ideal shade for my skin (which I love that MAC is wiling to do that for me) and took it home. I think I’ve mastered my morning face routine. I wash my face, apply eye cream, blend my foundation with my facial lotion and apply to my face. Then, I go for the concealer and dust off with powder to set. Apply whatever eye makeup I’m into that morning, add blush, and done. Quick, professional and easy. I usually go from zombie to human in less than 10 minutes. I substituted my block cream concealer for the MAC Select Cover Up liquid concealer and found it to be much smoother and creamier. It glided onto my skin more easily because of that (translation: less tugging would probably lead to less wrinkles in the long run). Coverage was really good. I applied the liquid concealer to my problem areas (under my eyes, around the nose – allergy season is NOT my friend, and occasional blemish areas on my face) and then carried out the rest of my makeup regimen. It didn’t seem to impact the longevity of my eye makeup so that was a good thing. No noticeable creasing because of its more liquid consistency. However, over the past week that I’ve been doing this, I do sometimes feel that my face seems a little heavier than usual which I wonder if it may be due to the creamier consistency of the liquid concealer. I didn’t have that feeling when I used my original block concealer which seemed to give me the same coverage but not the extra weight of a liquid concealer. Will I buy this product again? Yes. It matched my skin tone perfectly and gave me really good coverage. I’d probably use it for the colder months or for when my skin feels drier just so that I have that feeling of extra protection should my face decide to crack in half. Now, I have no clue if that’s good for my skin since I’m not a makeup artist but that seems to make sense to me. My daughter loves mushroom risotto, absolutely loves it but there isn’t always time to make it from complete scratch so I’ve had to try to look for different ways to make it for those super busy nights when I want to make something half decent at home and not cave into getting the overly processed fast food stuff. I tried a packaged mushroom risotto once for pure experimental reasons but got so grossed out at the flavour (crazy salty and odd ting) that I vowed never to do it again. I also try my best to avoid using canned foods like the plague because of BPA in the can linings. I noticed that Campbell’s had a line of tetra packed soups and one of them was the Campbell’s Gardennay Harvest Mushroom with Real Cream. I figured this might be a possible substitute for its canned cousin so I gave it a try. I got out the Arborio rice, the Campbell’s Gardennay Harvest Mushroom with Real Cream, and chopped up some brown cremini mushrooms and onions. I poured all 2 cups of the soup into the pot with 1 cup of filtered water and waited for it to boil. 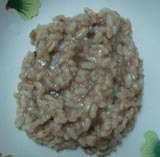 When it did, I poured in 1 cup of Arborio rice with a pinch more for good measure. I let it boil for a minute or so, stirring, then lowered the fire and let it simmer for another 17 minutes. Don’t ask me how I figured this all out. After a lot of trial and error, these numbers seem to work for me on those busy crunch days. Meanwhile, in a separate pot, I’ve got the mushrooms and onions sizzling away to build flavour for the risotto. I don’t put any other seasonings into it since I think the soup itself is salty enough. Every so often, I’d open the lid and check, stirring the pot and testing out the consistency of my rice. When the timer beeps at 17 minutes, I check it out my rice concoction and then add my mushrooms to the mix. Let it cool a bit so tongues aren’t burnt and voila, done! I paired it with a side of veggies and protein with milk and fruit to finish off the dinner. When pressed for time, this was an easy way to put rice on the table with a different flavour. It’s easy enough to add protein directly into the risotto (cooked ground beef in the mushroom pot with some black pepper or makes some scrambled eggs and add to the mix or even chickpeas if you’re organized enough to soak them the day before but this would take longer to cook up.) or as a side to the rice mix. My daughter loved it and it’s certainly healthier than some of the other deep fried options that are out there. All in moderation is the key! So, would I get the Campbell’s Gardennay Harvest Mushroom with Real Cream again in the future? Yes, because it’s in a tetra box and NOT a tin can, is better than some of the other options out in the market, but I wouldn’t use it daily because I know I can make it from scratch. Bananapalooza! (The Penguins of Madagascar) – a book of choices! Right now, my kid’s current interest is all things Madagascar. She was really fond of the first Madagascar movie and ever since then, it consumes a large portion of her day (we even draw Alex, Gloria, Marty, Melman, and all the other characters when we’re outside playing with sidewalk chalk). She’s also an avid reader. My kid can read independently and she pretty much screamed like she’d won the lottery when she saw this book at our local pharmacy. So, we bought the Bananapalooza! book, the perfect blend of her 2 current faves. Here’s the basic story line: you’re the new penguin at the New York zoo and you learn that King Julien wants to have a huge party called ‘Bananapalooza’. Only problem is, it’s taking place on the same day as the Night of the Zoo, a night where tons of humans are staying overnight at the zoo. The penguins (Skipper, Private, Kowalski, and Rico) are determined to stop King Julien. So, the question is: what will you do? First off, I was completely impressed that this was a ‘pick your destiny’ or ‘which way do you want to go’ type book for my kid’s age range. I remember being a huge fan of these types of books when I was a kid although I can’t recall how old I was at the time. I used to spend hours flipping back and forth trying to determine the fate of the character based on the different decisions I made. Since purchasing this book, we’ve gone through many different scenarios and my kid flips between helping King Julien to get Bananapalooza going or siding with the penguins to prevent the party from happening. There really are a ton of different endings and each one is different. Q: What do you think happens in this book? Q: What’s your favourite part of the book? Q: Who are your favourite characters from Madagascar? Q: What is your least favourite part about this book? The book says it’s ideal for children 4 – 8 years old. I don’t know if I necessarily agree with the age range because I think some of the concepts within the book may be too complex for a 4 year old to grasp. Some, like kidnapping (one scenario includes a suggestion that King Julien be kidnapped so Bananapalooza doesn’t happen) even puzzled my 5 year old. I’m also not sure I’d like such a concept to be included in a kid’s book for entertainment purposes. After all, it’s not a light hearted topic. 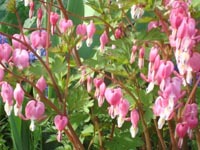 Some scenarios also led to endings that I thought happened too quickly. There were a few times where we got to the ‘The End’ and my kid said, “Huh? Now what?” because the storyline ended too prematurely. I would have liked it if the author had extended a few of the plotlines for the book. Having said all of that, my kid really does enjoy the novelty of this book and the freedom of being able to make different choices that ultimately impact the end result of the story. In a world where adults make most of the decisions, this book, from a child’s perspective is liberating. I also like the fact that she does get to practice decision making skills and to learn that with each action comes consequences in a fun and creative manner. I’m not preaching all this to her. She’s simply learning through practice as she turns the different pages and witnesses the different story lines unfolding. All in all, the book gets a 4/5 penguin slaps. Not bad, eh Skipper? At the Pharmacy: When in Doubt, Always Ask! Now that you’ve had some time to crawl through this mess of a website, you may have come across my review on the Opticrom Anti-Allergy eye drops ( if not, click here to read more! ). I learned a really important lesson that day when I went to go get those eye drops. You see, I ended up holding 2 different products in my hand, one of which was the Opticrom brand. The other product was a store brand, cheaper, but also claimed to bring allergy eye relief. After reading the ingredient list, I couldn’t figure out which would be the better product for me. So, I decided to go and line up and ask the pharmacist. If anyone is going to know anything about that ingredient list, it would be her! Guess what I found out? Aside from learning that the Opticrom brand was better, I also learned that the other brand contained an ingredient that with extended use, could increase the pressure in my eye. Now, I’m sure if I google that, I’ll find out all sorts of things that are going to make me more paranoid than I already am. So, I took her advice and picked up the Opticrom. In case you’re wondering, no, I don’t have shares in that company and I’m not trying to promote it or force you to buy it. I’m sure there are plenty of other equally good anti-allergy eye drop brands out there. But, what this one event made me realize was how glad I am that I made that step to ASK someone for help, especially when I didn’t really want to. I mean, really, who wants to line up to talk to the pharmacist and be number 10 in line? By spending the time and taking that step, I got important information from the pharmacist that I otherwise would not have had. Sure, the other brand told me on the box that it would reduce the redness in my eyes (I’m paraphrasing because I don’t exactly remember what it said) but I really appreciated the extra information from the pharmacist. Had I not asked, maybe I would have bought the other brand and while it might not have had a major impact on my health since I only have seasonal allergies, I can’t help but think of the ‘what if’. What if something did happen? What if I’m one of ‘those’ that aren’t captured by general statistics (can you see now why some of my friends think I over think?)? This one simple moment in my life made me value the importance of each small act. I’m glad I took action and stood in line to get what I needed that allowed me to make an informed decision. Thus, vital lesson learned: when in doubt, always ask (and not just at the pharmacy!). or has this been a really long week and it’s only Tuesday! I feel absolutely exhausted but as a parent, how often do we not feel zonked, pooped, and then some. Yet, we still somehow manage to put on a smile and answer each question from our children like it was the first time we’d ever heard it. That, is the essence of being a parent. No matter how zapped I am of energy from a long day at work (honestly, some days I can feel my brain yelling at me for the work related mental pains I’ve caused it), I become refreshed when I see my kid’s face and that gigantic smile that only I, as mom, gets to have because it’s a smile just for me. So, here’s a little round of applause to all the tireless parents out there who do what they do. 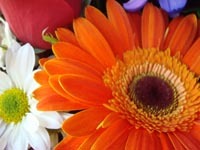 No matter where you are, we all share one common goal: to make every day a little bit better for our child(ren). As an informed parent, I’m sure you’ve all read somewhere about parabens in skin creams and all that other chemical stuff. I’ll admit, there have been times where I’ve put creams and lotions on my child that didn’t have the best ingredients but I did it at the time because it intervened when she had an eczema flare-up. I have been trying for the longest time to find a more natural skin lotion for my daughter to use that would be compatible for her sensitive skin and still work during those eczema prone months. 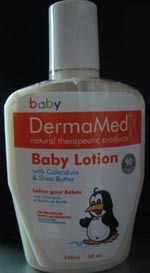 I found the Baby DermaMed Baby Lotion during a recent trip to the local natural health food store. The person who helped me actually recommended it to me since I was hesitant to try it. I mean, my kid is well beyond being a ‘baby’! The labels on the bottle inform me that it’s 90% organic (that’s good), it’s PH balanced (also good) and hypo-allergenic (again, good! ), has calendula and shea butter, and from what I can read, it’s paraben free (can’t find the word in the ingredient list). It’s also not tested on animals and contains no animal ingredients. Product review – What happened? I opened the bottle when I get home and notice that the baby DermaMed Baby lotion is quite light and absorbs really quickly into my skin. It feels airy almost, not greasy at all and has a light scent to it (kinda of reminds me of those ‘baby’ days when her skin used to smell just like a baby’s should). I’ve tried it on my daughter now for a full month and her skin feels really soft and smooth. We put it on after each bath and it goes on her hands and face too. The baby DermaMed Baby lotion really does absorb quickly into her skin and I feel really good about her using the cream because it’s more natural than some of the other stuff that is out there for young children. Q: Do you like using the Dermamed lotion? Will I buy the baby DermaMed Baby lotion again? Yes, I will because it’s natural, organic, isn’t greasy, and does my daughter’s skin justice. However, I have to be honest and say that I still use other products when my kid gets a bad bout of eczema and I’m okay with that because that’s not what this skin cream claims to do. It’s just a really really easy skin lotion for a young kid’s body, one that, as a mommy, I don’t feel guilty putting on her body. Pinkalicious Cupcake Party Game – 4 times the fun! Let me tell you about the Pinkalicious Cupcake Game. Now, if you’ve been tunneling through this labyrinth of a product review site, you’ll know my daughter loved and still loves Pinkalicious. Well, if your child adores Pinkalicious, he/she will love this game too. Not only that, family members (ie, you the parent) will also love this game because there is a lot to do and a lot to learn in this one children’s game. Now, I know the photo doesn’t do it justice. We’ve had the game for over a year and we still play with it often. When you first open the box, you discover that it is definitely worth your money. For starters, you get 6 stickers to create your own dice so you and your child can decide which side of the dice should be one of the following characters: Pinkalicious herself, Peter, Goldilicious, a paint palette, a butterfly, and a cupcake. I loved this idea of making your own dice. Of all the children’s games we have at home, this was the first one we came across that let you build your own dice. Talk about involving the child in the game play! There are four stacks of cards, 4 cupcake trays, 24 cupcakes, and a pad of pink paper with the Pinkalicious logo on top. The object of the game is to throw the dice, pick the corresponding card depending on the picture that lands face up on the dice, do the required instructions, and earn yourself a cupcake. Get all 6 cupcakes to win! I absolutely LOVE how entertaining this game is because it’s like 4 games in one. Roll the butterfly and you’ll have to do some charades so players can guess what you’re acting out. Roll the paint palette and you’ll have to draw what the card says. Roll Goldilicious and you’ll be doing a lot of moving around (sometimes, you even have to make up a dance to teach others!). Roll the cupcake and you’ll need to do some rhyming and chiming to earn your cupcake. Rolling Pinkalicious earns you a free cupcake (obviously! ), but watch out for Peter because he’ll swipe one of your hard earned cupcakes. As a parent, I watched my kid express herself through charades to make sure I figured out that she was planting a flower and I had to look REALLY carefully at her drawings to figure out that she had drawn a tea party (the school bus was a lot easier to decipher!). But, boy oh boy, was I in for a workout when my kid discovered her favourite stack of cards was Goldilicious. Each time she rolled Goldilicious, she would make the most elaborate dances and moves that left me huffing and puffing by the end of the game. Not only did my kid get to move around and be active, she also got to practice her literacy skills, reading the cards to figure out what they said. She also had to think critically about how to draw what the cards said. I had no idea how hard it would be draw a tea party until I had to do it myself! She also had to learn that it was okay to not win because Peter took her cupcake. That is some serious self-regulation skills that she learned in this one game alone. I also like how open-ended this Pinkalicious Cupcake Game can be. If you don’t want to, you don’t have to play to earn the cupcakes. There are some days, for instance, that my kid wants to do the entire stack of Goldilicious cards. Do you KNOW how tired I was at the end of that game?! Who needs to go to the gym, after that?! Other days, she’ll use the cupcake game pieces in pretend play, making cupcakes for everyone under the sun. The first time you play, it’s challenging as a parent to guess what your child is acting out or drawing but with repeated games, you’ll find it gets a lot easier since the cards start to repeat. I also really liked that my child learned to cope with Peter stealing the cupcakes, be it mine or hers. Now, we just laugh about it because it means we get to play longer but in the beginning, there was a lot of ‘why is Peter taking my cupcake’ that led to some serious problem solving. After reading all of this, is it any wonder that I gave the Pinkalicious Cupcake Game a 5/5? Honestly, even if a child doesn’t like or know about Pinkalicious, this would be a great gift paired with the original Pinkalicious book. For my daughter, this game has extended the shelf life of the original story and has helped her develop her brain and her muscle strength. How perfectly pinkatastic is that? !